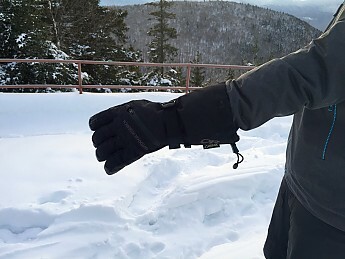 The Southback Sensor Gloves by Outdoor Research make it possible to snap photos and stay connected on the trail without risking frozen fingers. They incorporate sensor technology so you can use touchscreen devices without de-gloving. 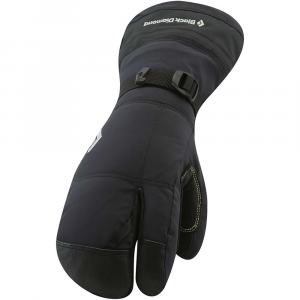 The Southback is a comfortable glove that keeps me warm even on cold winter days. However, while the sensor technology works well, I found myself having to take my gloves off in order to access my phone, and therefore just didn't take advantage of the sensor feature all that often. 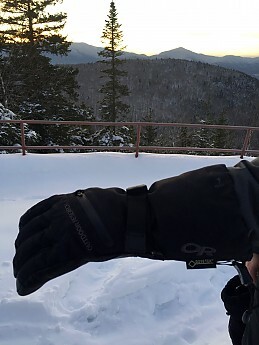 Testing Conditions: I tested the OR Men's Southback Sensor Gloves as a member of the Trailspace Review Corps from October 2017 through March 2018 in and around the New Hampshire White Mountains. Temperatures during testing ranged from about -20 to 45 degrees Fahrenheit. The Southbacks are lined in a soft, fleece-like material (which according to the specs is actually polyester). It offers my frozen fingers a warm, comfortable home! 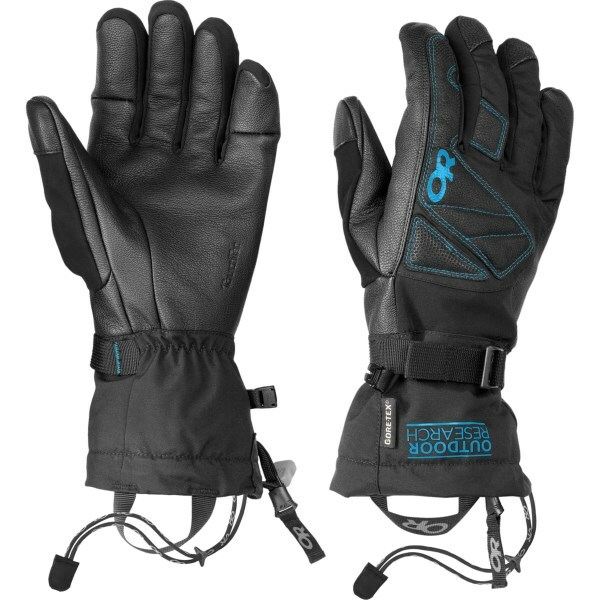 Adjustability: The gloves extend mid-way up my forearm, cinching securely in place over my outer layers with an elastic drawcord. It's easy to adjust with the gloves on thanks to a plastic pull-tab. After I pull the gloves off, the drawcord is easy to expand. 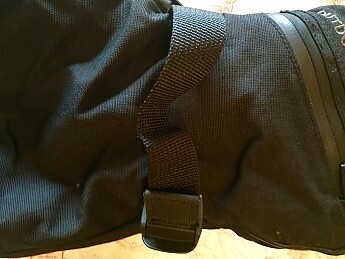 There are nylon straps at the wrists, which adjust to allow the glove to fit securely. Water Resistance: The Southback is constructed of a waterproof GORE-TEX nylon laminated shell and a water resistant goat leather palm. They consistently keep my hands dry, even in wet spring snow conditions. 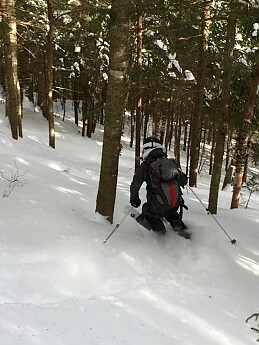 Breathability/Moisture: I wore the Southback gloves alpine skiing, backcountry skiing, fat biking, snowshoeing, hiking, and on one particularly frigid day, nordic skiing. The gloves breathe as well as expected, but they tend to be overkill during high-exertion activities (depending of course on the temperature). 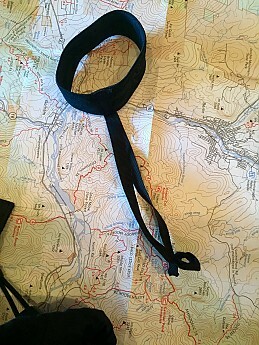 I found myself wearing them during the initial portion of an ascent, but usually peeled them off, opting for a thinner layer, once my body warmed up. 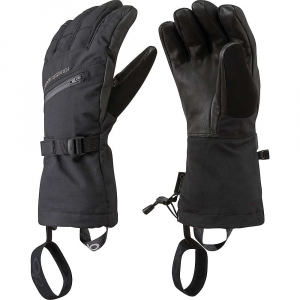 Warmth: The Southback gloves consistently kept me warm during outdoor adventures. 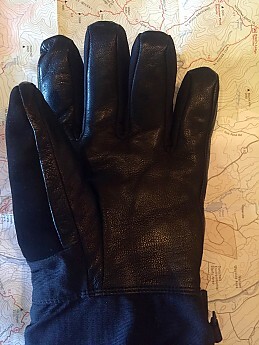 They were a welcome layer during the summit transition of backcountry ski trips, giving my hands a little shot of warmth and preventing them from getting cold during the descent. I wish the insulation extended about an inch beyond the hand, covering a portion of the wrist. On especially cold days I noticed my wrists could get a bit chilly as jackets and base layers don't tend to offer any real insulation here, and the portion of the glove covering the wrist and forearm is wind and waterproof but not insulated. Layering: The Southback layers well with a very thin liner, but I wouldn't suggest wearing anything more than that. 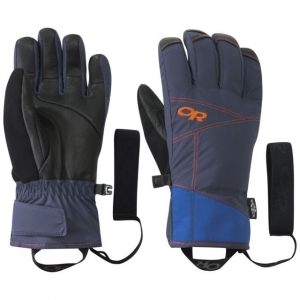 I usually wore it without a liner and found the glove provides enough insulation on its own. 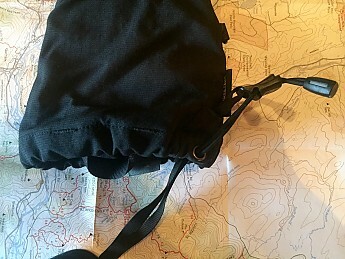 Function and Ease of Use: As previously mentioned, the drawcords and wrist straps do their job. 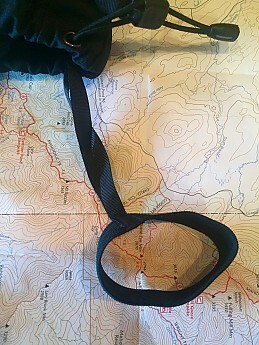 The Southback also has a removable elastic "leash" that can be worn around the wrist. 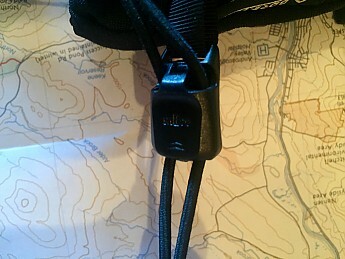 It's technically detachable, but I found that feature difficult to use, so I'd suggest just keeping the leash connected. I enjoyed this feature, as it allowed me to remove my gloves, on a chairlift for example, without worrying about dropping them. The leash reminds me of the mittens I used to wear as a kid—the kind connected by a string. A healthy dose of nostalgia pairs well with any outdoor excursion. The elastic around the wrist is tight enough to offer security without being uncomfortable or risking cutting off circulation. 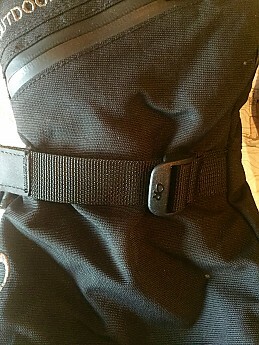 There is a zipper pocket on the back of both gloves (in the women's version it looks as though the zipper is only on one glove). I honestly didn't find much use for it, but I suppose one could use it to store a car key or perhaps some cash or a credit card. The pocket is water resistant but not waterproof, so best to store items that won't be damaged by moisture. Features: What sets the Southback apart from other gloves on the market are the touchscreen sensors on the thumb and forefinger. 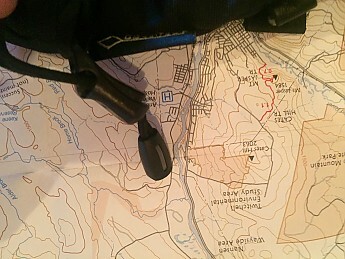 Let's face it, our phones often accompany us on the trail and it can be helpful to have gloves that acknowledge this reality. Overall, it's fairly easy to operate my phone with the gloves on. I can text and snap photos or videos without too much difficulty. Due to the size of the fingers on an insulated glove, dexterity is somewhat limited. Occasionally I'd hit the wrong letter when texting, but overall I was impressed by the accuracy. The technology works surprisingly well. That being said, were it not for the purposes of gear testing, I don't think I would have used the sensors much, if at all. Here's why: on days when it's cold enough to justify wearing these gloves, I find that in order to preserve battery life I need to store my smartphone in the pocket of an inner layer, not simply zip it into a pocket of my outer shell. To access my phone, I have to take my gloves off and unzip a layer or two. So, while I suppose I could put the gloves back on once my phone is in hand, I found it was easier to just snap a quick photo and store my phone rather than taking the gloves off and on multiple times. Perhaps those who wear insulated outer layers wouldn't have this problem. It likely depends upon the gear you're wearing and how accessible your phone is. However, while the feature is certainly appealing, I just didn't find myself using it all that frequently. Construction & Durability: The gloves have held up well over the past five months. I've had no issues with the material or waterproofing breaking down and the leather on the palms isn't showing any significant signs of wear. 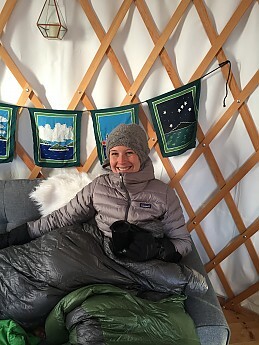 Keeping warm in the Southback Gloves while our yurt heats up! 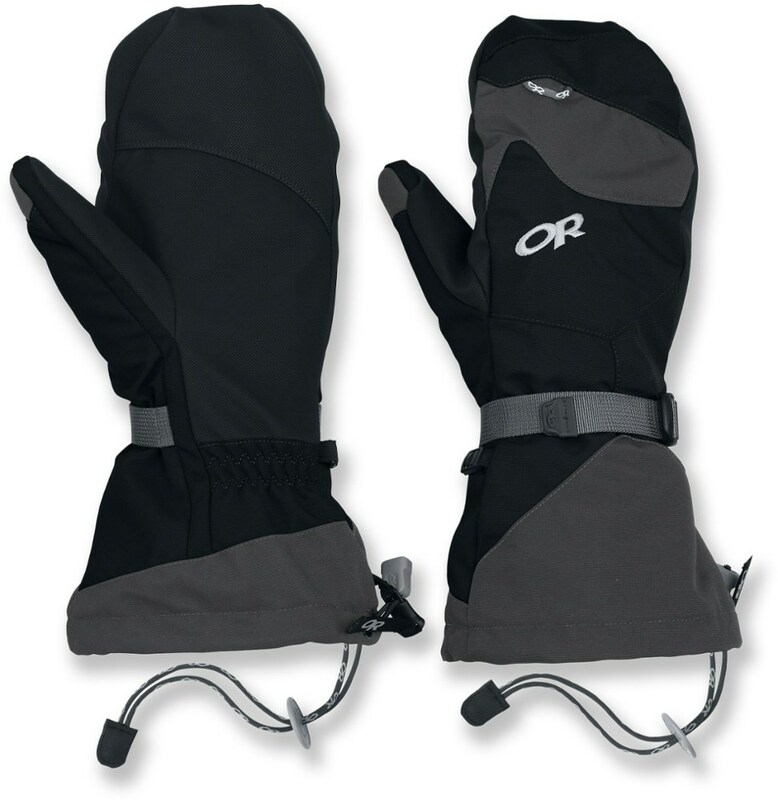 Overall Impressions: I got a lot of use out of the OR Southback gloves this winter. 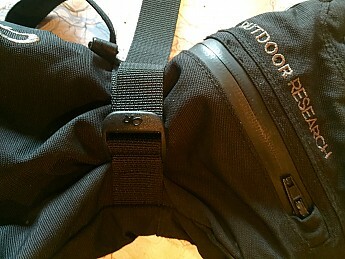 They consistently kept me warm and toasty and were a welcome addition to my outdoor adventuring. 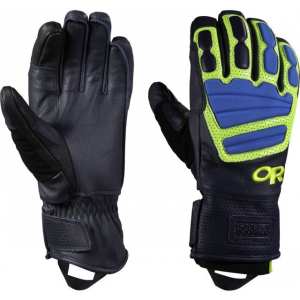 The sensor technology is an appealing feature that works well overall given the thickness of the insulated fingers of the glove. However, as I've mentioned, it's just not a feature I found myself using often. 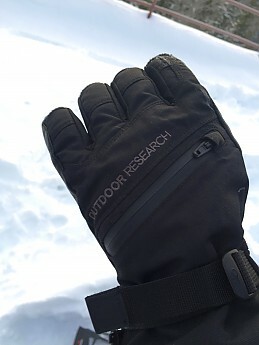 Thanks to the folks at Outdoor Research and Trailspace for the opportunity to test these gloves! Nice review, Kelly! 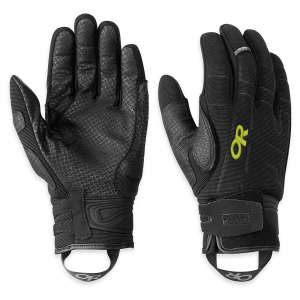 Thanks for testing out these OR gloves so thoroughly this winter. Interesting gloves. But for truly cold conditions I need gloves with REMOVABLE liners so I can use extras while the first set dries.